If someone asked you what your most valuable asset was in your company, what would you say? Probably your team, right? For New Breed, our team is what makes us exceptional (not to toot our own horn or anything...). Our team is full of passionate inbound marketers, who work tirelessly to make our company better and make our customers happy. The second most valuable asset we have (and you have also) is our customers. And it is our goal that each and every one of our customers has a great experience when they work with us. Why? Because not only do we want them to keep working with New Breed on all of their inbound marketing needs, we know that our customers are also our biggest brand fans. Meaning if they're happy, they'll talk about us, share our work with others, and help promote us. 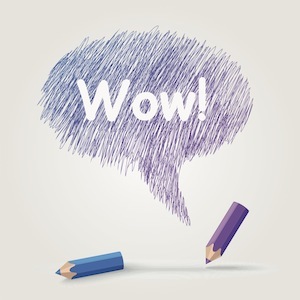 Today we're offering a challenge: do something every day that will wow (at least one of) your customers. Clients value being included in your process. Even if it slows you down, it's important to take the time and work through each engagement together and make sure that you're including them as part of the process. Not only will collaboration help build buy-in as you get deeper into your engagement (and make approvals easier), it will also build trust. Transparency is something many companies struggle with. They feel like if they show their customers too much into their business, it will just do more harm than good. We beg to differ. If your customers are interested in seeing how your organization works, why would you prevent that? They want to learn more about you and ultimately (like collaboration), being transparent will build trust. And when you have their trust, you'll be much more likely to have a long-term relationship with them. Like any relationship, both business and personal, being honest is paramount. Lying and sneaking around always catches up with you in the end, and will result in bigger headaches, more angry messages, and even break ups. All of which could have been prevented if you were just honest from the start. Think about it this way: say you're working on a project with your client and you're seeing that it's trending over budget. Rather than saving that conversation until the end of the project, where you just hit them with the overage charges, have that conversation up-front. We can guarantee that by having those difficult conversations as soon as they happen, it will save your relationship lots of pain in the long-run. Business doesn't always have to be just about business. Try to have a more personal connection with your customers. Ask them how they're doing, how their weekend was, or how their kids are doing. It makes them feel more connected to you, helps to humanize your organization a little more, and again, builds that trust that is so essential to the success of your relationship. The more you can learn about your customer and their business, the better chance you have at exceeding their expectations (and wowing them!). Don't be afraid to ask questions. What information do you need to help your company be successful? Even if they're tough questions to ask, or your client is hesitant to share, try to get as much information about them as you can. If you know what they truly need and can deliver a solution that solves that need, the bigger of an asset you'll be to their organization.